"I never gave any thought whatsoever that I would NOT go to college," says Patricia "Pat" Barrack Gibson '62. "From the time, I was six, I was playing teacher with my dolls. From the age of twelve, I was saving the money I earned from picking tomatoes, babysitting, waitressing, and working at a local bank." Pat grew up in the Northern Neck region of Virginia. Her father died when she was three, and her mother worked hard to make ends meet. With Pat's small savings and two scholarships at Mary Washington - the Lalla Gresham Ball Scholarship and a State Teachers Scholarship - she became the first in her immediate family to attend college. 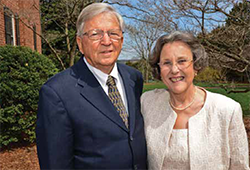 Pat and her husband, Merv, now are making it possible for aspiring education ormedical students from the Northern Neck to attend Mary Washington through the Patricia Barrack Gibson '62 and Mervyn Gibson Scholarship. "I'm proud of the focus on excellence that I experienced as a Mary Washington student," says Pat. "And I'm truly grateful for the opportunities that have been mine because I made the choice to attend MWC." After graduation, Pat taught high school English in Virginia for three years, and then served as a statewide trainer of volunteer tutors for adult literacy programs in South Carolina. She became the first English-as-a-Second-Language teacher in Charleston County,S.C., Public Schools. After receiving an M.Ed. in reading from The Citadel, Pat then began the first of several positions in education during a 25-year tenure at Trident Technical College (TTC) in Charleston. She retired from TTC in 2006 as the Dean of the Learning Center. Pat now volunteers as an elementary school reading buddy, teaches Sunday School, and is a "Master Gardener." When possible, she and Merv attend UMW events, and they remain loyal Mary Washington supporters. "For a number of years I made small annual donations, but I always had in mind that - one day- I would make a larger gift," says Pat. "Upon my retirement, we finally had the resources to establish an endowed scholarship at Mary Washington. Recently, we also offered our support to the Mary Washington First Campaign by designating UMW as a beneficiary of a retirement account." Pat says she loves meeting, and receiving thank you letters from, UMW scholarship recipients. "My husband and I still live frugally and modestly," she says. "But knowing we are helping students from my native Northern Neck acquire their college diplomas gives us great joy." The Gibsons are members of the UMW Heritage Society and the Washington Society.